A fuel efficient automatic transmission fluid recommended for GM, Ford and Toyota transmissions where lighter viscosity oil is required. Provides the same excellent protection and performance as AMSOIL ATF. Recommended for vehicles requiring GM DEXRON® VI, Ford MERCON® LV and SP, Honda DW-1, Nissan Matic-S and Toyota WS fluid specifications. Transmissions in commercial vehicles, SUVs, trucks and vans particularly those used for hauling or towing are subjected to severe-service operation and increased heat. Elevated temperatures cause fluids to break down, allowing damaging metal-to-metal contact and the formation of sludge and deposits. The problem is worse in modern transmissions with more gears, clutch packs and narrow oil passages that require clean, high-quality fluid to achieve maximum performance and life. Thermal Stability Hot temperatures are no excuse for poor reliability. Naturally heat-resistant and heavily fortified with anti-oxidants, AMSOIL Low- Viscosity Automatic Transmission Fluid exceeds the most demanding oxidation requirements. It delivers outstanding protection against sludge and varnish deposits that clog narrow oil passages and contribute to clutch glazing. AMSOIL Low-Viscosity ATF protects hot-running transmissions. Cold-Temperature Fluidity Cold, thick automatic transmission fluid lengthens shift times and reduces energy efficiency (fuel economy). AMSOIL Synthetic Low-Viscosity ATF is wax-free and delivers extraordinary cold-flow performance (<-60°F pour point). It helps improve shifting response and energy efficiency while reducing warm-up times. To demonstrate its effectiveness in severe service, Signature Series Multi-Vehicle Synthetic ATF was installed in vehicles owned by a Las Vegas cab company. The vehicles routinely encountered demanding stop-and-go driving loaded with passengers and cargo, while the desert environment presented extremely hot ambient temperatures, placing enormous strain on the fluid. 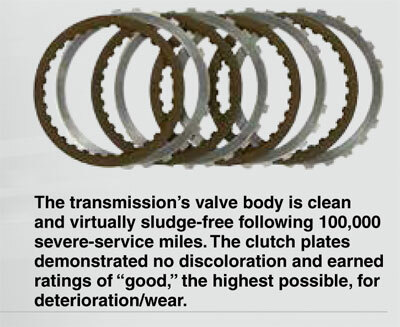 Following 100,000 miles, a transmission was selected for analysis. The Aluminum Beaker Oxidation Test (ABOT) is one industry-accepted method used to determine a transmission fluid's oxidation resistance, which is a good indicator of its service life. 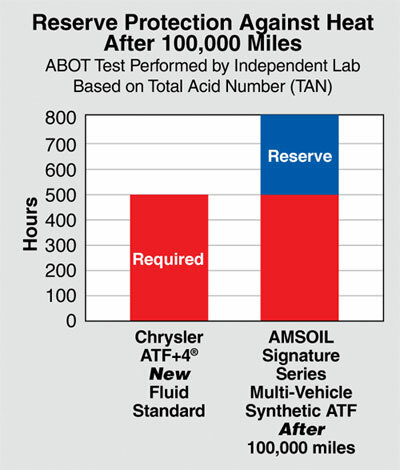 Testing by an independent, third-party lab reveals that after 100,000 miles in severe service, Signature Series Multi-Vehicle Synthetic ATF resisted oxidation longer than required for new fluid to meet the Chrysler ATF+4 specification (see graph). 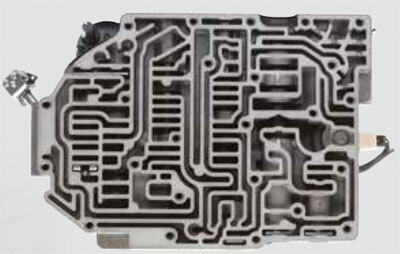 Internal components, including the valve body and clutch plates (pictured), were virtually free of damaging sludge, deposits and wear, confirming the lubricant's high level of protection for severe-service applications. Signature Series Synthetic ATF is formulated with high concentrations of antioxidants, making it naturally heat resistant. As a result, it provides outstanding protection against sludge and varnish deposits that clog narrow oil passages and contribute to clutch glazing. After 100,000 miles in severe service, fluid analysis revealed Signature Series Multi-Vehicle Synthetic ATF contained 41 percent of its original oxidation inhibitors, proving its long-lasting resistance to thermal breakdown. Varying speeds and loads causes torque multiplication and extreme stress on gears and bearings. AMSOIL formulated Signature Series Synthetic ATF with high film strength and premium anti-wear/extreme-pressure additives to help prevent wear during severe service. In the industry-standard FZG Gear Wear Test, Signature Series Multi-Vehicle Synthetic ATF that had been used for 100,000 severe-service miles achieved a "Pass" at stage 12 - the highest stage. The results exceeded the Ford MERCON V and Chrysler ATF+4 specifications for new fluid, demonstrating the lubricant's long-lasting wear protection. Today's transmissions are smaller and must withstand higher horsepower and torque while delivering smoother shifts, all with longer fluid life recommendations. AMSOIL Signature Series Synthetic ATF is formulated with friction modifier additives that deliver outstanding clutch-holding capacity (static friction), torque-transfer ability (dynamic friction) and anti-shudder properties (slipping torque-converter clutches). Analysis reveals that after 100,000 miles in severe service, Signature Series Multi-Vehicle Synthetic ATF provides nearly identical friction properties as new fluid for smooth, reliable shifts. Ford MERCON® LV, SP; GM DEXRON® VI; Aisin-Warner AW-1, Audi G 055 005, G 055 162, G 060 162; BMW 83 22 0 142 516, 83 22 2 152 426; Honda DW-1®; Hyundai/Kia SP-IV; JWS 3324; Mitsubishi SP-IV, ATF J2; Nissan Matic-S; Saab 93 165 147; Shell M-1375.4, M-1375.5, M-1375.6, M-L 12108; Toyota WS; Volkswagen G 055 005, G 055 162, G 060 162.